President Rodrigo Duterte reiterated his full support for Philippine National Police (PNP) chief Dir. Gen. Ronald "Bato" dela Rosa over the administration's campaign for drugs, noting that the country's top policeman has copied his style of blustery rhetoric well. "Alam mo, si Bato nauunahan ako sa yabang... Iyon ang style ko eh. Sinunod talaga niya pati tuloy ako hindi makasalida [take the first spot]. Limitado na ang papel ko," Duterte quipped, drawing laughs from the audience at the 10th anniversary rites of the East Mindanao Command in Panacan, Davao City. Duterte's pronouncement comes a day after Dela Rosa grabbed headlines when he urged drug addicts in a speech in Iloilo to kill drug lords and burn their houses. Presidential spokesperson Ernesto Abella defended Dela Rosa, saying the statement was simply a passionate call to resist drug lords, not an incitement to kill. 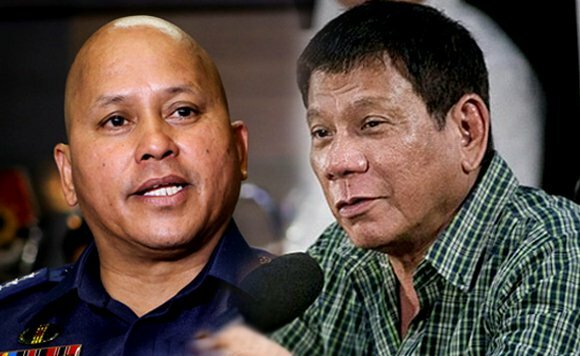 Duterte, for his part, vouched for Dela Rosa, noting that he has known the police chief since his days as a young officer in Davao City. Duterte even served as a godfather in Dela Rosa's wedding. "But you know Bato, he has my support... He is simply loyal to the republic of the Philippines, not to me," the President said.